Background: Employee engagement in the retail industry has long been an uphill battle, but Starbucks has been a trailblazer in the field, pioneering generous health benefits, tuition support, and long-term career development programs. But are these efforts paying off? Critically, have they impacted the mindsets employees hold about Starbucks in a way that fuels retention, recruitment, and ultimately profit? 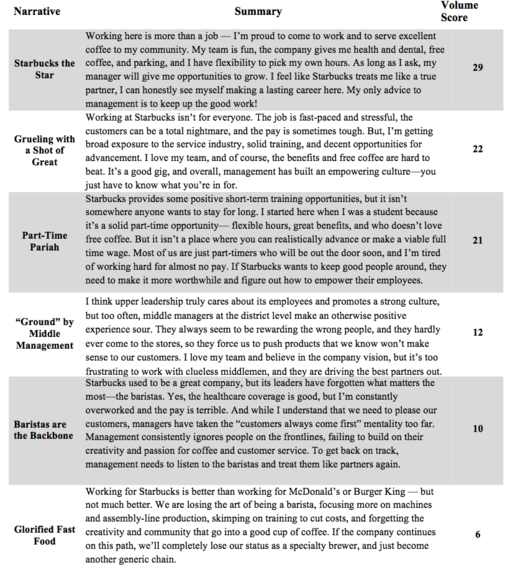 Using over 5,000 company reviews from Glassdoor.com, Monitor 360 applied its Narrative AnalyticsTM methodology to uncover the narratives that employees hold about Starbucks and identify opportunities for Starbucks--and others in the retail industry--to improve employee engagement initiatives, optimize its externally-facing employment brand, and drive business success. In the world of retail, Starbucks is an undisputed champion of employee engagement, recruitment, and retention. CEO Howard Schultz claims that Starbucks' relationship "with our people and the culture of our company is our most sustainable competitive advantage." The company prides itself on its "legendary service," and supports wide- ranging perks for members of the Starbucks "family"--including full health benefits for part-time employees and unprecedented tuition reimbursement for Arizona State University's online courses--that frequently attract top recruits in the retail industry. Starbucks' innovations in employee engagement have yielded tangible results, contributing to an average rating on Glassdoor.com of 3.8 stars out of 5--compared to 2.8 for Dunkin Donuts and 3.2 for Peet's Coffee--and helping Starbucks to beat the average industry turnover rate by 140%. Yet in spite of its impressive performance in relation to its peers, the level of turnover at Starbucks is still costly, requiring the company to invest $3,000 to replace just one barista. What more can the company do to close the door on employee exits and attract high- quality recruits? Beyond just offering more expensive perks, how can Starbucks leadership identify what motivates their 190,000 employees, and more effectively connect with--and shape--existing beliefs employees hold about the company that affect morale and inform the perception of their "employment brand" with prospective employees? Monitor 360 set out to understand the "why" behind employee satisfaction at Starbucks--to uncover what employees really believe about the company, and identify new opportunities to more effectively shape engagement initiatives. 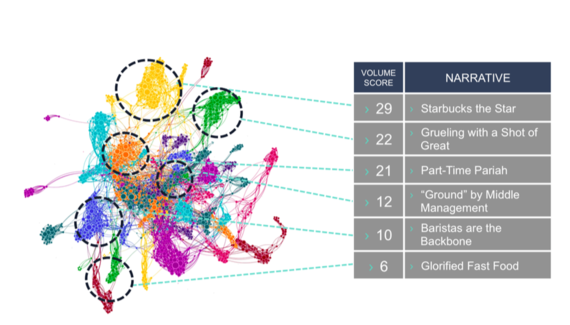 Using our Narrative Analytics methodology, we analyzed over 5,000 U.S.-based employee reviews of Starbucks on Glassdoor.com. 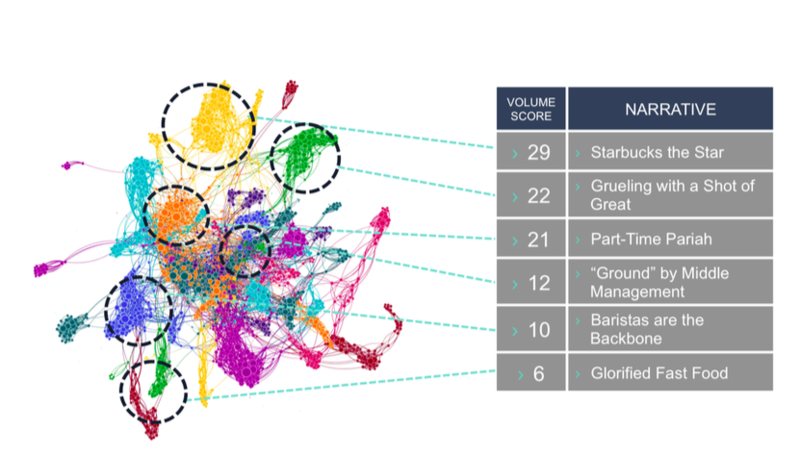 Through our analysis, we surfaced six distinct organizational narratives that employees hold about the company, and measured their Narrative Volume. More than 60% of employee comments expressed confidence in Starbucks' senior leadership and company vision. The three narratives that comprised this coverage-- "Starbucks the Star," "Grueling with a Shot of Great," and "'Ground' by Middle Management"--focused more on employees' pride in Starbucks' vision and values than on benefits, suggesting that consistently delivering an inspiring narrative about the value of employees to the company can motivate as much as offering free lattes. What's more, the two highest volume narratives--"Starbucks the Star" and "Grueling with a Shot of Great"--suggest that Starbucks can be an exciting place to build a career. Moreover, even negative narratives like "Part Time Pariah" and "Baristas are the Backbone" praised the benefits and perks that Starbucks provides. Interestingly, these narratives referenced employees' satisfaction with cost-efficient benefits, like free coffee and parking, more often than more costly ones like excellent healthcare coverage--indicating that sweeteners small and large can deepen employee satisfaction. While narratives like "Starbucks the Star" and "Grueling with a Shot of Great" depict Starbucks as an exciting place to build a career, narratives like "Part Time Pariah" and "Baristas are the Backbone" bemoan the difficulties of building a career at Starbucks--revealing one critical driver of employee turnover. While less prominent than positive narratives about the company's vision and values, combined they comprise a concerning 31 percent of total employee comments. The "'Ground' by Middle Management" narrative suggests that many employees who have a positive view of Starbucks as a corporation simultaneously hold major concerns about middle management. Many view middle managers as out of touch-- visiting stores infrequently and promoting those who are undeserving. This suggests that leadership's efforts to brand Starbucks as a place for opportunity resonate deeply with employees on an emotional level, but that same vision is not regularly communicated by local company leadership nor does the inspiring vision always match the day-to-day reality. Though it was lowest in volume, the "Glorified Fast Food" narrative also posses potential existential challenges to Starbucks' internally and externally facing brand. This narrative reflects employee beliefs that Starbucks is losing its identity as a specialty brewer, suggesting that replacing the art of brewing with increased mechanization can damage retention. This narrative also presents threats to Starbucks' external brand: Should it spill over to Starbucks' customer base, it could endanger Starbucks positioning as a provider of "special experience" that founder Howard Schultz refers to as the "third place", undermining its ability to charge premium prices. Amplify narratives connected to company values. 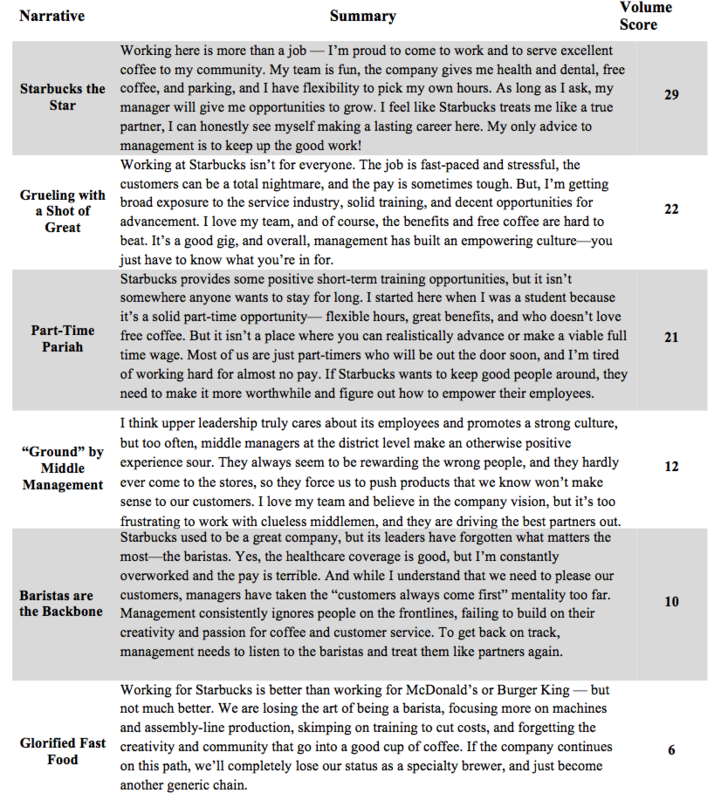 High impact narratives like "Starbucks the Star" suggest that Starbucks employees are uniquely motivated by the company vision and commitment to employee engagement. Starbucks should articulate this vision to employees consistently and continually to ensure this narrative remains top of mind. At the same time, it's critical to continue to deliver generous perks and rewards to employees to ensure that employees feel the message from leadership is credible. If Starbucks faces pressure to cut costs, it would be wise to avoid cutting these perks as doing so risks increasing employee turnover. Address concerns around "'Ground' by Middle Management." By assessing narratives that arise in internal survey comments tagged with key demographic indicators, such as geography, age, or position, Starbucks can pinpoint where concerns about middle management are most acute, and build a targeted strategy to address those concerns. For example, Starbucks could build training programs in regions where the "'Ground' By Middle Management" narrative is more prevalent to foster more productive interactions between lower and middle level employees, and expose managers to daily challenges in stores that they can help to address. Reframe "Glorified Fast Food." Starbucks can invest in understanding what triggers the "Glorified Fast Food" narrative before the narrative creates existential threats to the company's consumer facing brand as well as their employment brand. With proper data and deeper analysis, Starbucks can uncover the actions, communications, or strategic decisions that inflame this narrative, such as investment in drive-through locations or replacing manual processes with machines. Examining the narratives that consumers espouse about Starbucks in social and traditional media outlets can also help leadership to monitor and address the threats this narrative presents. What can other companies learn from Starbucks' employee engagement strategy? To better connect with employees on their own terms, other companies should leverage the wealth of online data from sites like Glassdoor as well as existing investments in internal data to understand what employees are saying about them, and gain insight into the narratives that drive perceptions and behavior. Versions of narratives like "'Ground by Middle Management" exist in many companies, the trick is understanding what triggers them. Companies should consciously design their communication and engagement initiatives around the unique narratives their employees hold to ensure that they resonate with employees, and address their unique concerns. Firms can then monitor narrative changes over time, measure the impact of communication activities, and adjust tactics to improve employee engagement.